Poll closed Jul 19, 2012 . Where Could we ever find peace with such a Destiny? Change comes and goes. Like the gentle sway of ocean waves, like the dance of tree leaves in the whispering winds, like the recede and push of the Soul's breath. It is the solid immortal in every withering mortal. The one constant rhyme in the ever changing melodies, the one favored tool of time. It touches all and leaves none without its touch. It knows no sides, no blacks, no whites, it drapes its cloak over all. Anything is its cause and reason, it knows no bounds in that very matter. Things of Grandeur with all their greatness may as well end up bringing about the smallest of changes, it happens even when least expected, it really does. And yet, even the smallest things can bring about astronomical changes, and leave nothing as it was before. The Academy of Mysidia is a private military educational institution situated 23 miles southeast of the City of Puravama, the capital of the Kingdom of Lorican. It was founded 73 years ago by the renowned war veteran and summoner Cid Akerias and his partner and long time friend Dr. Loire Pascal, recorded to be one of the greatest medics of his time. Together they funded and operated the Academy and opened its doors for the first time to students three years after its establishment with Cid Akerias acting as the first Headmaster of the academy while his partner Dr. Loire becoming the Head of the Medical Division and teaching professor. The Purpose of the Academy is to teach and train youths in the arts of Magic preparing them into becoming part of the Academy's specialized military forces, The Aspis. Admission to the Academy of Mysidia is completely free of charge, allowing any and all students who wish to study about Magic and its marvels a place in the academy's ranks as long as they are 15 years of age or older. The Academy adopts a system of seven grade levels, with roughly 100 students within each grade accounting to around a total of 700 student count in the whole academy. The Academy year starts at September 1st with a celebration that welcomes the new and returning students back to the academy. Upon entrance students are assigned to a room and roommate in the boy or girls Dorms depending on their gender, and given the academy's standard Uniform which is required to wear as long as the Academy is in session, otherwise free dress is in order. The Uniform consists of a long-sleeved and collared white mid-length coat with a neck-tie, black pants, gloves and boots for male students, and a puff-sleeved or short-sleeved white shirts with a neck-tie or ribbon bow, black vests, straight short skirts, gloves and boots for female students. Student also have the choice to don the Academy's mantles and cloaks depending on weather conditions. The colors of the neck-ties or bow ribbons and mantles corresponds to the student's current grade: the first grade having yellow ones, second grade blue, third grade orange, forth grade red, fifth grade green, sixth grade indigo and seventh grade grey. Each student is also issued a small silver pin that carries the Academy's symbol. The Academy's distinct symbol is a reference to the adamontoise's sturdy and indestructible shell. Academy Students study in seven main fields (see:Heads of Divisions) which are divided into a number of classes they are expected to attend on regular basis. Upon reaching the forth grade, students are allowed to choose the courses they will study in accordance with the field they wish to specialize in. The Academy's curriculum has been designed to be flexible both for combat purposes and the business world at large. Schedules are quite adaptable and changeable due to the nature of the Academy's educational system which might require some students to become absent for a while from the Academy. The Academy also requires from its students to participate in at least one club of the sports or cultural clubs to encourage socializing among the students and involvement in club activities. The Academy is equipped with the latest state-of-art technology and facilities to accommodate the student and staff population. All meals, housing, transportation, books, ect. are taken care of by the Academy. The Aspis is the academy's specialized military force acting as a mercenary force for hire, conducting missions around the world as battle support and undercover operatives. Their services are requested by a variety of clients including both governments and normal civilians; their tasks range from providing military support to protecting civilians. The Missions are generally done in teams and headed by one of the Head Divisions or one of the Generals. Members of the Aspis consist of the Academy's students, select members of the Academy's Alumni and the Academy's Division Heads and Headmistress. The Aspis acts as the main source of financing and funding to the Academy and its operations, that in addition to providing the Academy's students with real field experience in using magic. In order for a given student to become a member of the Aspis, they have to be at least a 4th grade student or higher, though there has been a few exceptions with some student who were considered prodigies. The students must also pass a three-stage written, oral and field exams, and once they pass they are appointed a rank -either a cadet, general or commander - in the Aspis depending on their results and performance during the Exams. Because of the special status of the Aspis, the Heads of Divisions serve as the teaching Professors for Aspis Members instead of the other faculty members. The highest position of staff at the Academy of Mysidia is the Headmaster or Headmistress position which is currently held by Athena Odine. There is also a Deputy Headmaster or Headmistress, who will take over responsibilities of the Headmaster should the circumstances demand it and is usually held by one of the Heads of Divisions. The Academy, in addition to its support staff, has seven professors serving as the second highest rank in the staff after the Headmaster position. Each Head Professor leads a division of his own concerned with his field of specialization and heads the team of subordinating professors in his division as well as act as the leading beacon to the Academy's special forces, The Aspis. Head of Physical Combat and Field Strategy Division: Responsible for teaching students Physical combat and nuturing them about the different strategies one should adapt on the field. He is a key person as well in the Academey's central operations where missions are formally discussed and issued. Current Head of the division is held by Calipher. Head of Magical Combat Division: Responsible for teaching students how to gain acute control over their power and how to deploy combative magic on field. He is also responsible for helping them define the primary role of magic which they excel in, effectively determining their future role in the Academy's special forces. Current Head of the division is held by Mayuka Ashford. Head of Medical Magic Division: Responsible for teaching students about the specific branch of white magic and Potion making. Mainly used for medical purposes. Wounds don't just close with an utter of a cure spell. It takes great discipline and knowledge as well as delicate and expert hands to apply the right spells and control the healing process of an ally's wounds. What medicine could do in days and months, Medics achieve in minutes and hours. A reason why Medics are considered one of the academy's greatest assets, and yet an asset that also requires proper protection. Head of Summoning and Creature Care-taking Division: Responsible for teaching students about the art of summoning and the care taking of the different beasts and creatures. Not only do they provide for the best Beast Hunters and Tamers around the Kingdom, Summoners are also greatly respected for the breakthrough ability to do what was once thought a mere dream. For the longest time it was thought that it was impossible to reach the realm of Niflheim or as called by many the realm beyond the veil. A realm of existence invisible to Humes' eyes, separated from our world by a great veil of Mist. it is where the Eidolons -great spiritual creatures- dwell. Despite still not being able to reach this realm, Summoners exercise an ability that allows them to initiate a spiritual connection with an Eidolon and summon it temporarily into our realm. However, To intiate a strong magical connection with a spiritual being requires a special talent and requires extra care with nuturing it. It is the reason why Summoners are such a revered role among others and greatly differ in their practice of magic than the acknowledged norm. Current Head of the division is held by Abeo Destati. Head of Magical Research and Development Division: Responsible for teaching students about the relatively new branch of blue magic, that reveals the wonders of Magitek (Magic Technology) field. To harness magic into a machine that ampilifies it's functions? That's their speciality. Fusing spells together to generate a new one, inventing machines that makes better use of your magic, are all their forte. Though there are rules, there are measures to take before you step bravely into this wilderness. Not only are they responsible for researching and improving the quality of magic within the Academy, the Magical Research and Development Division is also responsible for providing the academy with their latest research and developed products that they engineer and produce. These include but are not limited to consumer weaponry, defense outfitting and medical technology. Current Head of the division is held by Kevin Avius. Head of History and Magical Support Division: responsible for teaching and nurturing the students of the academy about the history of their world and its various cities and countries. Though that might be only for just the sake of appearances. The true specialty of this Division is gathering Intelligence and protecting the Academy's secrets. Their line of work includes Espionage, Under cover and Clandestine operations as well as Counterintelligence. Usually the members of this division are hardly ever volunteers and are specifically hand picked by the Division Head and Generals. That's due to the sensitive nature of this division, and the special type of skills and magical abilities it requires. Current Head of the division is held by Minami Izumi. Before I can talk about Magic, I have to talk about Mist. Mist, or Mana as called by Humes, is a supernatural force that dwells continually within every living person. It is essentially the catalyst that enables Humes and other races to control and manipulate energy, thus doing Magic. Magic comes in short bursts of Mist used to accomplish single specialised tasks called spells. These spells vary in nature and task from simple ones such as conjuring Fire or complicated ones such as fusing two magical spells together. They can either be used for aggressive maneuvers or passive protections, and they are basically fueled by one's pool or well of available Mist. The only exception to this tier hierarchy is a brand of Magic called Unique cast which consists of a number of specific spells which are powerful and unique on their own (for more info see: Unique Cast). A Mage's experience and control with a spell gradually lessens the amount of Mist used for said spell as well as increases its quality and potency in turn. As such, if a novice mage needs to use a large amount of Mist to produce a Firaga spell, an experienced Mage can use in relation a very small amount of Mist to produce a Fire spell with the exact same potency and power. It all comes down to exercised control and experience, and a certain amount of talent. Thus, it is important for a mage to exercise control and regularly train to increase the quality of their magic. Despite this, no mage can ever excel in every brand of magic there is, no matter how much they would try. This is because, naturally, one's Mist tend to be inclined to a certain brand of magic than the other, and it is in that brand that a mage excels best with practice and experience. Said brand naturally defines a person's primary magic class. Of course, one could still use the other types of magic, but it is not with the same strength that his primary class would allow him. Each person has a certain amount of Mist, that can increase relatively to their development and training, and ever slightly with artificial means. However, the forced increase of a person's Mist can have dangerous consequences that might end up with death. A person's body can ever endure a certain extent of Mist, but if it ever breaks that limit, a person could end up with Mist poisoning. The process of Mist poisoning ills the body and spirit of the Hume, and ends up eating away at their spirit and body till they are nothing but empty shells. As thus, many are advised to exercise caution when tampering with their own Mist, if they ever need to. A branch of Magic that specializes in curative and enhancing spells. While Generally not an offensive brand of magic, White magic is not short from offensive spells such as Holy. Someone who excels in White Magic is called a Medic. Cure: a spell that intiates healing process. Raise: a spell that awakens a knocked out/ comatosed/ or controlled ally. Esuna: a spell that removes s harmful status off an ally. Regen: a spell that slowly heals an ally gradually over time. Dispel: a spell that debuffs any enhancing magic cast on an opponent. Holy: a spell that manifests from pure light energy that inflicts damage on a given opponent. A branch of Magic that specializes in spells that use dark arts to deal damage or negative status effects. Though often a branch that is costing even to the user as much as it is to his opponent. Users of this branch often have a very unfavorable reputation among their peers due to the dark nature of their magic. Someone who excels in Arcane magic is called an Aracner. Dark: a spell that manifests from pure dark energy negating all light around an opponent and inflicting damage upon them. Berserk: a spell that induces great physical prowess but with the price of being overridden with pure instinct negating a person's logic. Confuse: a spell that at its most basic level confuses the opponent, blurring the line between reality and illusions temporarily, thus why sometimes victims of this spell mistake their friends for their enemies and attack them until the spell ends. At a more powerful level it places the opponent under the caster's control, allowing the caster to weave illusions to the opponent's mind causing them to attack their friends and even inflict self-damage. At its most powerful state, an is opponent placed in a calm, trance-like state in which all feeling of responsibility and anxiety is banished, but the caster in such case is just a puppeteer to a marionette. This spell is considered by many Mages an unethical spell, and usually those who use this spell are looked down upon as unmoral due to the spell's dark nature. The spell, however, is not without a flaw since a person with a powerful will can still resist and break the effect of the spell upon them. That is why this spell is only very effective when a Mage is highly experienced in the dark arts, and has a masterful control over the effect of the spell and a strong mentality to use it. Drain: a spell that absorbs an opponent's stamina and into the user, though it requires physical contact. Syphon: a spell that absorbs an opponent's mana/mist and into the user, though it requires physical contact. If used excessively, the user could suffer from sever Mist poisoning. Reverse: a spell that reverses the effect of another spell, however, the opposite effects are not always predictable. Gravity: a spell that can manipulate the gravitational field of a given area to either crush opponents or fling them off the ground. However, the spell is not selective and induces its effect on both allies and opponents in the field. Magnet: a spell that attracts an object to the user. Pain: a spell that induces a sense of pain on the opponent. Amount of pain depends on the level of spell. Requires making eye contact with the opponent for at least 3 seconds. Shadow walk: a spell that casts an illusion on the looker, causing them to see after images or spectral clones of the user. While the mirror images are just mere after images of the user that can't inflict any damage, it is still difficult to distinguish the true caster among these images. A branch of Magic that specializes in spells that buffs and enhances status effects of Allies and weaken opponents. Considered by many the most popular magic branch. Someone who excels in green magic is called an Augmenter. Protect: a spell that casts a shield around its user against physical attacks. Shell: a spell that casts a shield around its user against magical attacks. Blind: a spell that shuts off an opponent's eyesight temporarily. Poison: a spell that inflicts a poison on an opponent, depleting their life gradually until the opponent dies. Silence: a spell that shuts off an opponent's voice, and prevents the opponent from casting magic. Sleep: a spell that induces sleep on opponents. Requires the user to either make physical contact or make eye contact for more than 3 seconds with their opponent. Bravery: a spell that raises and increases an ally's physical strength and endurance. Faith: a spell that raise and increases an ally's magical strength and magical endurance. Slow: a spell that extends a field that slows down opponents' actions. However, the spell is not selective and induces its effect on both allies and opponents in the same field. Immobilize: a spell that robs an opponent from his ability to move, effectively paralyzing them. Requires the user to make and maintain physical contact with their opponent, so the spell holds. Reflect: a spell that casts a shield causing magic to be reflected off the user. However, depending on the level of spell impacting the shield, it might give away and break apart. Also, for the the caster to maintain the shield for more than just a momentary block, they have to stay stationary in order for the shield to be stable and endure more than one spell, yet that means the spell keeps on absorbing larger amounts of Mist from the user. Haste: a spell that speeds up one Ally's actions. Float: a spell that causes the user to float and levitate above ground. Stop: a spell that effectively Halts the actions of an opponent, however, they are still aware of their surroundings despite their frozen state. Requires the user to maintain eye contact with their opponent for more than 3 seconds. Warp: a spell that allows the user to teleport from one spot or location to another. However, it can hardly be ever used in succession due to the amount of concentration used as well as the charge of Mist needed to use every time a user intends to teleport. Vanish: a spell that Renders an ally invisible from the eyes. A branch of Magic that specializes in offensive spells that harness the elemental powers of fire, ice, lightning, wind, earth, and water. Those that harness the power of their terrain to their advantage in battle, ravaging their opponent with their elemental prowess. The practitioners of Black Magic are known for their destructive powers, and damage entailing abilities. It is for this reason that Black Magic is considered by many the simplest branch of magic as well as one of the most direct and damage invoking ones. Someone who excels in black magic is called a Ravager. A branch of Magic that specializes in the arts of summoning and taming beasts that aids the user in battles. Unlike other branches of magic, summon magic relies on a different type of spells that is unique in nature. A summoner relies on initiating a spiritual link between themselves and a beast, using that link as their means of communication and mediation to tame the creature and ally it to themselves. Summon magic also involves summoning the powerful and supernatural beings, the Eidolons, from the world beyond the veil, Niflheim, to fight for and defend them in battle. By far, it is the one branch of magic that requires talent and exceptional mental strength more than any other. For while the stakes are high, the end results are definitely rewarding. Summoners are also the one class that can learn directly from the Eidolons and benefit from their knowledge, as such it comes to no surprise that summoners are the first who have learned about the Unique Casts, for the knowledge was given to them by Eidolons. Someone who excels in summon magic is called a Summoner. Call: A spell that initiates a spiritual link between the user and their allying Eidolon. Usually, this is accompanied by the Creature's Glyph appearing and acting as the gate for the beast to come into our world. Depending on the strength of the connection and the user's control, the summoned Eidolon does the bidding of the summoner and aids them. However, if the summoner loses control, the Eidolon may endanger everyone including the summoner themselves, taking reins and control of the summoner instead of otherwise. Summoning usually requires a large amount of Mist and summoner's Mist keeps depleting as long as the Eidolon maintains their presence in our world. Mediate: A spell that focuses the summoner's spiritual connection on the creature, allowing them to communicate and allowing the summoner to tame the creature and win it to their side. Depending on the level of Mist a summoner uses with the creature and the strength of their communication, a summoner can even attain a complete and full control of the Eidolon, using the creature's more powerful attacks, or even using their more sharper senses. Bind: A spell that allows the summoner to bind the creature should they ever need to restrain the creature's strength. It manifests in a number of magical chains that bind the creature and restrain them physically and magically. It is noted though that this depends on the Summoner's strength of will and control, should they ever waver or hesitate the chains can be broken. Surge: A spell that allows the summoner to release a huge amount of the creature's restrained power, letting them surge with more than usual amount of Mist. This allows the summon to attack with much greater power and freedom. This unsealing process, however, puts the summoner at a greater risk of losing control over their summoned creature, as well as depleting them rapidly off their pool of Mist which leaves them potentially defenseless. * There are many summonable creatures that a summoner can call onto battle, and even the same summon can be summonable by two different summoners right at the same time (e.g. Two summoners can have Two Shivas on the battlefield simultaneously). This is because there are more than one eidolon of the same kind. However, there are especially 9 summons that have no like. They are called the Great avatars and unlike normal summons can not be summoned by an average summoner requiring a huge amount of Mist and very masterful summoner to grant them entrance to our world. These summons are Leviathan, Bahamut, Phoenix, Titan, Alexander, Anima, Ultima, Hrimthurs and Quezacotl. A branch of Magic that specializes in the study and enhancement of spells as well as increasing their potency and effects. Being a relatively new branch of magic, blue magic does not possess many characteristics that distinguish it from other branches of Magic, quite the contrary. Users of Blue Magic has always been considered by many people jacks-of-all-trades but masters of none. Since it is a field that specializes in the study of magical spells and methods of enhancing and improving them, blue magic encompasses the use of them all. 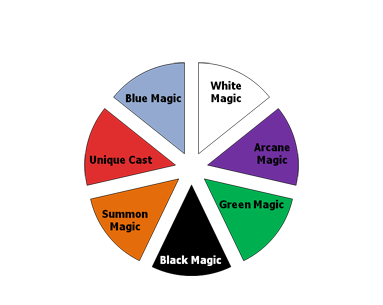 This gives the practitioner of blue magic the advantage of being compatible and proficient in all mage classes, effectively making them have a primary role in all the classes and easily appearing as the strongest class among all the others. Reportedly, a mage's primary class gives him proficiency with the class's spells ranging from 80-100%, this makes a practitioner of Blue magic a force to reckon with on the battle field. While that might make the class seem flawless, it comes with no surprise that this mage class faces a major weakness. Despite having a strong proficiency in all classes, this leaves the practitioner of blue magic to specialize and excel at no certain branch of magic. As thus, they almost never go past third tier spells (-ga) and lose the ability to strengthen their magic further like other classes. This severely limits blue magic, as its practitioners find themselves unable to focus on one specific field or progress a spell to its most powerful form. That is why, although many name Blue magic the master of all classes, it is only a quest that is fulfilled in its starters. As thus, a practitioner of blue magic doesn't have a secondary role. Practitioners of blue magic, however, didn't let the obvious restriction that faces them to halt them from progressing. By using what they posses in their arsenal of diverse and powerful spells, they seek to augment their magic further by the use of machines and the magic technology (Magitek). Scientists of that field having designed machines that make use of magic, have allowed the practitioners of blue magic to enter a new frontier and still be valuable on battle field. By using magic fueled machines, practitioners of blue magic invented machines that increase the potency of the spells cast through them as well as enhance their effect by using magical items such as magicites and pre-charged weapons. This approach was furthered by using Magitek to make machines that could make up for spells that required users to sacrifice Mist, and even machines that a person who is not versed in magic could still use to elicit spells or similar effects. Someone who excels in blue magic is called a Blaster. Libra: A spell that allows a user to sense and discern the workings and state of their chosen target, helping them in identifying their opponent's weaknesses. However, a practitioner of blue magic is more compatible with the spell that they can discern the workings and state of their targets in a more detailed and clearer way, as well as extending the range of their spell to anything that falls within their range rather than targeting a single opponent. Fusion: A blue magic spell that allows the user to fuse two spells together to acquire a stronger third outcome. However, the spell requires acute control and considerable amounts of Mist. The resulting spell is rather powerful, depending on the two spells used, yet it costs double as much as normal spells. A branch of Magic that specializes in especially extremely powerful spells that are far more endangering in nature and considerable in magnitude than normal spells. These spells are a special brand of their own, and unlike many of the other Magic types, these spells neither have tiers nor do they correspond to a certain class of mage, and are compatible to anyone who has been given one of these spells' proper knowledge. However, Such spells require an especially certain degree of great knowledge and mastery to wield which makes them inaccessible to many mages even those experienced enough in their magic. As thus, it is considered a great feat for a mage to learn a single spell of them, let alone two. Originally, these spells were not a magic invented by man like the other branches, but one that was acquired through the knowledge given by the Great Avatars and High Eidolons to powerful summoners. It was through the summoners' mediation that the other Mages asked for the knowledge of these powerful spells from the Great Eidolons, for no one could pass their knowledge except their original owners. For that very reason, it is impossible for a mage to acquire or master any of the Unique Cast spells without the cooperation of a Summoner. Ruin: An offensive spell that brings ruin and swift ageing process to anything the spells hit. One of the devastating spells that lies in the possession of the all powerful Alexander. Ultima: An offensive spell that calls upon a huge sphere of searing green energy that entraps its opponent within, and consume his very soul. A spell of great power and unparalleled pain, reportedly those who have survived the spell have told that they experienced nothing more painful in their entire existence. The spell unlike many others, doesn't leave any physical injuries as it targets the victim's soul, effectively scorching its mark right into their psyche. The spell is named after the signature attack and the Eidolon of the same name. Meteor: An offensive spell that summons a barrage of meteorites to bombard enemies. One of the powerful spells in the arsenal of the King of the Skies, the great Eidolon Bahamut. Shock: An offensive spell that calls upon a flash of lightning so powerful that its shock wave alone could split a mountain in two. A spell that lies in the arsenal of the great Quezacotl. Flare: An offensive spell that calls upon flaming energy so hot, they blister the very air with unbearable heat. These white fires are Bahamut's signature attack, also known as Mega flare. Scathe: An offensive spell that calls upon a beam of intense stellar energy, eradicating anything in its path. A spell that could only be given by the fortress of sanctity, Alexander. Break: An offensive spell that is able to petrify whoever it hits, turning them gradually into stone. A spell that the mighty Giant, Titan, can ever choose give to his beseechers. Scourge: An offensive spell that releases a noxious miasma capable at prolonged exposure to incapacitate the opponents. A spell in the possession of the fearful Eidolon, Anima. Frost: An offensive spell that freezes the place it hits in mere seconds, writhing everything within it in deadly ice, and extinguishing any such warmth of life. It is the signature spell of the emperor of ice, and father to all ice creatures, Hrimthurs. Tsunami: An offensive spell that summons overwhelming waves and bone shattering tides of water. 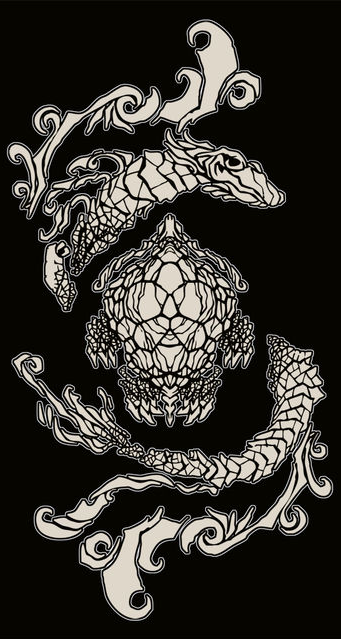 If one should ever seek this spell's power, there is no other than the great sea serpent, Leviathan. Bubble: A supportive spell that increases the strength and endurance of the user, as well as their magical strength 50 folds than their true one. A spell in the possession of the High Eidolon, Gilgamesh. Earthquake: An offensive spell that summons a powerful earthquake so terrifying in its magnitude. The signature attack of the high eidolon, Hashmal. Typhoon: An offensive spell that summons a devastating Typhoon, turning the winds into blades of utter destruction. The signature attack of the high eidolon, Garuda. Divine Touch: A curative spell that through divine light can cure any disease or wound and bless its subject with longevity. However, it is a rather rare spell, and very few individuals have ever come to possess it through history. It was never known who was the Great Eidolon that possessed this spell, rumors say it belongs to a long lost High Eidolon. The Kingdom of Lorican is a relatively small Kingdom situated at the north east of the continent of Penohix, surrounded from its north by the stretching blue of the Nevay Ocean, and sharing its borders from the south east with The Republic of Alumier, and the Crystallorum sea and south west borders with the Empire of Altaire. 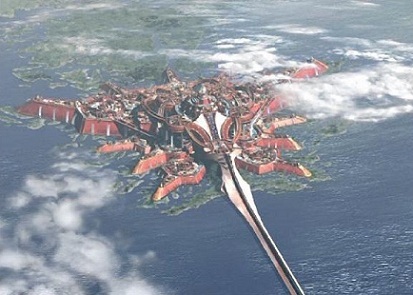 The Kingdom's cities and towns resemble greatly our real world ones, with things such as modern technology, cars and highways, skyscrapers but also contains some Final Fantasy-ish elements that influences the workings of the world and its culture such as magic, castles, armored soldiers, airships and chocobos. Technology wise the Kingdom possess a slightly more advance form of technology that is used in everyday life of the citizens, the different fields of science and almost everything else; Specifically Magical Technology or Magitek, a relatively new field that combines the power of magic with machines and science, has seen a lot of progress in the recent years and and has contributed greatly in benefiting the nation and raising the expectancy of life, becoming rather an influential part to the Kingdom and its citizens. The Kingdom is currently ruled by the Royal family of The Ashfords and the Kingdom's Senate, with King Lucis acting as the current ruling King. The City of Puravama, the largest city in the Kingdom, is the capital and is where the Royal Family resides, acting as the center of culture and Hume society to the whole Kingdom. The Academy of Mysidia: Based near the Trabian mountain ranges, The Academy of Mysidia is located on a peninsula overlooking the Crystallorum sea and surrounded by open green plains which they take tactical advantage of. The academy enjoys a Warm Season most of the year except in Summer when occasionally heavy misty rains does happen, and when Winter Season arrives with its snow. Within The Academy, there are a number of facilities available to the student and staff population that were designed to accommodate the nature of the academy, combining the aspects of both military operational feel with the affordability and relaxing nature of a prestigious boarding school. The first floor, or middle division, is separated into two rings. The outer ring is preceded by the Academy's front gate which acts as the academy's main entrance and a fountain plaza. The outer ring itself contains the first floor lobby, a small number of shops, the gymnastics hall, an indoor Olympic-size swimming pool, an open quad, a parking garage and the auditorium. The inner ring contains the dormitories (divided into boys and girls dormitories), a spacious cafeteria, a grand library, infirmary, an all-hours training center, the main ceremonial hall, and the elevators to the second and third floors and underground levels. The second and third floors, collectively known as the upper division, contain the classrooms, laboratories, administrative offices, central operations, the staff's dormitories, and the Headmistress's office. The three underground levels, known as the lower division, contains classified laboratories and experiment chambers, Military storage facility, the operation center for the Academy's intelligence, Magitek development and research facility and the operation center for the Aspis. Entrance to the lower division is only allowed for members of the Aspis and certain faculty individuals, students and other members of the Academy require a special permission to access the lower division and a special key card. The primary training facility for the Academy is a short distance to the west from the main Building itself. It houses several extensive training grounds and chambers, simulated battlegrounds, and weapon ranges. The Academy possess its own Airship Hangar which houses their Airship Fleet used primarily in missions, it is located a short distance to the east from the main building of the academy. If it is entrance you seek, then by these rules you must Abide. 1. This is an Invitation Only Rp. Appologies for any Inconvenience. 3. Literacy is a must. I understand that nobody is perfect but I would like to be able to read what is written and understand it clearly. 4. Romance is allowed, just keep it within the forum standards. 5. The rp will be mature. As in there will be some blood, gore, excessive violence and graphic deaths. If you can't handle it, don't join. 6. Activity. I can not stress this enough. Please, only join if you are willing to post and stay active. I don't want someone to join and never post. Or start a template and never complete it. I believe that's being Fair, no? 7. Keep the fighting realistic. No one wants to be in a fight with a person who forsees every move and blocks every attack. 8. No Canons, please. I don't want to see Lightning strolling by, or someone referring to Squall as their protective God-father. Try and be creative and original. 9. I reserve the right to remove any roleplayer from this RP if their conduct merits it. 10. There are no limitations to the number of characters you can have, as long as you can maintain each of them well enough. 12. If you want to have a character that is not part of the Academy VM, or PM me. 13. Please, do not edit your Template after it has been accepted unless you have been told otherwise. 14. Feedback about the Rp is always welcome, and if you have any idea, suggestion or question about the RP feel free to discuss it or pm me about it. 15. Most Important rule: Relax, and enjoy your time. This RP was solely made to entertain you! Every Story has a Beginning. Yours Begin Here. Name: First and Last Name. Age: No less than 15 and no more than 22. Background: At least Two Paragraphs and try avoiding it being longer than needed. Personality: A minimum of Two Paragraphs. How does your character act? Try and make your characters real and dimensional. No one likes flat and static characters =3. Appearance: A minimum of one paragraph. This also applies to those who like using images. Strictly Human. Nothing with holes of light in their abdomen or scales in their chins or swishy tails in their Backs. Mage Class: Your Primary Class and Secondary Class. Bloom: [Locked] (For Now leave this a blank, You'll be allowed to fill it later when it has been explained). Limit Break: A powerful physical or magical combat move that breaks the character's limit. This move is typically one of the most damaging moves in your character's disposal, however, because it breaks the limit of your character's power, it leaves them utterly exhausted afterwards. It is usually triggered when your character is in a critical state or in moments of strong emotional bursts. Trinity Attacks: [Optional] These are group attacks with two or more characters combining their attacks and efforts together to gain a higher hand in battle. Weapon: Do you use any specific kind of weaponry? Do tell me about it. Try avoiding 'Legendary' or 'Made of Unknown Material' ones. And let's try all to be civil about Gunblades, Shall we? Dear me my Fellow FF-Fans but I have seen what could drive a moogle out of his pompom, Kupo! Clubs: The After School Clubs you are in. Clubs are many, you could choose or create one for yourself if you so like. Other: Themes and any miscellaneous facts about your character go here. Title: If you have any. Age: No less than 25. Division: You are the head of which Division. Background: At least Two Paragraphs and try avoiding it being longer than needed or shorter than appropriate. Weaponry: Do you use any specific kind of weaponry? Do tell me about it. Try avoiding 'Legendary' or 'Made of Unknown Material' ones. And let's try all to be civil about Gunblades, Shall we? Dear me my Fellow FF-Fans but I have seen what could drive a moogle out of his pompom, Kupo! "My road is what matters. The Road of Justice." Background: Ace was born into a wealthy family, His father was a well known politician while his mother was a doctor. His father was a cold and calculating man, relentless in his pursuits and a stonewall to opposition. This is not to say he was a bad man, his views always had the interests of the people in mind. Ace's mother is like a calmed offset to his father. She always had a content glint in her eyes, sympathy and understanding were first nature to her. Growing up Ace hardly ever saw his father, though the rare times he did the man always had sparse yet resounding advice for him. His mother was hardly ever not in his life, and even though she spared only vague words to him at times her actions spoke for themselves. Whenever a problem arose she never hesitated to throw herself into it, resolving to fix it. Even at a young age Ace had his eyes and heart set on the academy. He wanted to be a large influence like his father, and a steadfast paragon like his mother. So he entered the school, and setting his mind on his studies quickly advanced. He found he had a knack with multiple types of magic as well as technology so he decided the blaster class was befitting. Tri-Disaster - An attack which Ace can only used when pushed to his limits. It is a three stage attack, composed of the elements water, thunder, and fire. First Ace unleashes a torrent of water comparable to a massive ocean wave, upon hitting his target the water spirals around them trapping them in a vortex. Next a volley of lightning bolts are summoned to strike the body of water, using the liquid as a conductor to cause more damage. To finish Ace creates a thirty foot tall sword of fire, and crashes it down upon the intended target creating an explosion of fire. Mana Gloves: A pair of gray metallic gloves with interlined devices embedded in them. What makes these gloves special is that a magic infused device inside connects them to Ace's Mana pool. Using this connection large amounts of magic energy can be channeled through them. Using these gloves Ace can enhance his strength to ten times that of the average grown man. It also allows him to channel black magic elements to amplify his attacks. An example of this would be lighting the gloves aflame, or giving them a snap freezing effect. The gloves are also miniature computers, so they can be hooked up to various devices to interface with them. Ace also has a pair of boots that are largely the same, sans the computing power. Mana Bow: A metallic bow much similar in design to the Mana gloves, they too have a connection to Ace's magic. The bow is retractable, and easy to carry. It has no need for arrows, since they are created via Ace's influence. Using black magic he can create arrows composed of sparks, ice, ect. He can also use white magic, creating arrows that do not cause harm but heal those struck with low level curative effects. "My road is what matters. The Road of Equality." Background - Mayuka Ashford is the daughter of Van Ashford, Prince of Lorican who surrendered his claim to the throne in search of greater knowledge and a real-world experience. From that journey he had eventually took a commoner from an abusive household and taught her all he knew to help her defend herself. Though how it all occurred is another story, the commoner had fallen in love with him, and he eventually did so in return. From the love they shared, three children of extraordinary ability were born from the union. Mayuka was one of those children. From an early age she excelled in black magic to a level so advanced that her bloom came very quickly in childhood. With her gift she sought only to help others in need; helping cleanse lakes, restoring power to sections of the city that needed it, nothing was 'above' this young lady of royalty. Inheriting her father's desire for knowledge and being taught a great deal when growing up, Mayuka had a desire to use her knowledge to help teach others to use the ability of magical combat for the good of others. Though her father had given up his claim to the throne, Mayuka's kindness and impressionable social skills have had peers and elderly alike encourage her to somehow make her way to being the Queen of the kingdom some day. Believing her calling was teaching rather than rule, she has currently chosen to focus all her time into her studies so she may take an open teaching role at the Academy. Despite people suspecting she only managed the job due to her royal blood, her hard work and dedication into learning all she could about magic and its practices had landed her the job of teaching Magical Combat. It'll be her first year actually teaching, instead of job shadowing with a family friend. Personality - Mayuka is mute, or at least near it. She is extremely rare to catch talking if she even can, and there isn’t any conceivable explanation to it on any record. Maybe she can’t speak at all. Maybe she never has a reason to talk. Point being, she usually expresses herself with her physical appearance. From what one can tell, she is a sweet young woman with an enjoyment of water. It can be soothing and peaceful, but in an instant, can become harsh and unforgiving, much like Mayuka herself depending on actions people take. She enjoys making friends, and eventually even her friends can come to understand her after enough time has gone by. She dislikes pollution and appreciates good hygiene. A quick reminder in case you didn’t know; she enjoys water, you’ll probably find her near any body of it if you don’t know where she is beforehand. A downside to this is that she can be incredibly naive and it would allow dishonorable people to get away with certain things within reason. 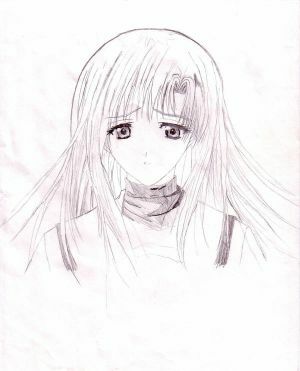 She’s not stupid, but sometimes she doesn’t understand when someone is doing something wrong for her own sake. That was who she was growing up. Due to increased exposure to society and kindness being given and received Mayuka has grown much more talkative than she once was. While her love of water hasn't changed, her naivety has gone down considerably and having become a mature young woman, is wise and responsible enough to see troublesome people. Other than that, very little has changed, she is still gentle and kind as she was as a growing young girl. Appearance - Mayuka stands at 5’11 having silver-blue hair with slight silver tone, hardly noticeable, and amber eyes. Her skin is smooth and a healthy pale. She wears black sneakers with blue jeans and a thick dark-blue sweater that fits her perfectly. You will find no trace of make-up on her body and very rarely would there be any accessories such as rings or bracelets. Her body is average, the chest not flat but not very large at the time either. Her bottom portion however gives her some nice thighs and a very eye-grabbing bottom that is of attention-grabbing size and shape, complimenting her already curvy and matured body. Though she possesses the beauty of an angel, Mayuka is very modest about her appearance and doesn't spend much time taking care of her appearance. She does enough to be presentable each day, and leaves it at that. You will almost never find her checking herself out unless it were for something very, very important. Her pin is kept on the front neck of her sweater. Limit Break - Contamination - Mayuka’s emotional build-up can reach a peak of negativity so large that it may alter her physical appearance. Her hair, a mixture of silver and azure blue, will turn dark, and her eyes will change from amber to a blood red color. While in such a negative state her control of elements is plenty more chaotic and her precision and care is out of balance. Her range of control is increased as well as her overall perception, and the amount at which she can do at a time is significantly higher than before. Her attacks are packed with more fury and hate, disregarding those that come near her and washes them away with whatever she sees fit in her arsenal. Because of how tragic and fierce this state is, Mayuka will only use it if her life, or the life of someone dear to her is in danger. In this case, if there is an innocent life on the line if she loses, or the one who put her in a state of weakness is on the verge of beating her, she is more likely to shift if the outcome is of significance to her. Trinity Attacks - When partnered with the Head of Physical Combat and field strategy, Mayuka will imbue his weaponry and ability with her Bloom's ability, causing his shadow and all shadows under his control to constantly channel one of the elements she generates to form a more lethal weapon. Together with two attacks made of elements, overwhelming the opponent is usually inevitable. A combination of attack maneuvers could be used this way. Weaponry - None, her Bloom is the only weapon she needs. Other - Themes and any miscellaneous facts about your character go here. And accepted Promise =). Your character has been added to the roster. I'll see if I can get a template up soon, hopefully all these videos I gotta render out for Youtube doesn't kill my time. But this RP looks really interesting so count me in! "My road is what matters. The Road of Knowledge." Terrance was never really a part of the upper tiers of society. In truth, he was always smack dab in the middle of society. His family wasn't poor, but they were far from being rich. They were simply comfortable. This is why they were able to buy various books for the only son of theirs. They understood that books tend to lead to wisdom and that it's really one of the best ways to teach a child. But they did not count on Terrance being a little too into the books to the point that he would act out the epic battles and even take on the roles of the characters for days at a time. For years things were fairly awkward for the family. The family finally go a break from the odd child when he was sent off to the Academy where not only would he really react the battles that he read about, but he could even act out battles all his own. But even here he was considered odd. Throughout his years at the school he would automatically designate people with names or titles from the books that he read. It was during his earlier years that he gave Ace the title of "Magistrate" out of respect for the guy. But that's not the only thing that seemed odd about him. It was found that through the books that he would always read, that he had an affinity for Black Magic and a sword. That is how he went on to choose the Ravager class of mage. Terrence is an odd one indeed. He doesn't go out of his way to find trouble, but it would seem that trouble always finds a way to find him. Because of this he is often times avoided by the normal people of the school. But another reason for this is because he will always manage to sneak quotes from various books into his conversations that often times leaves the listener confused. But that's not to say that he's a bad person. He actually enjoys spending time with his friends to the point that he would gladly stop reading one of his books. He's never really one to judge and will even show kindness to his enemies when not in battle. This is simply because he knows that war is just a difference of opinion. As such, he expresses his client's opinion in battle only. Otherwise he can get along with anyone brave enough to try and talk to him. But through all of this, there is really only one thing that he loves above all else. And that is the pursuit of knowledge. Rence stands at a somewhat threatening height of six feet with the build of a master swordsman. That's not to say that he's overly muscular. In fact, his muscle tone comes from him constantly training with a weighted training sword to build up only the muscles that he uses in combat. But even this is not always enough to keep his body in shape. Because of this he does light weight training with a healthy supply of cardio. But all of this is not seen, save for his arms, unless he takes off his clothes. When he is not required to wear his school's uniform, he is often times seen with a black t-shirt that he tends to hide in battle with a padded armor vest. This is the only thing that fits snugly to his body. His pants are loose fitting and of the same color, so it can be said that he doesn't have much sense in the ways of fashion. But taking the attention from his build and clothes, that just leaves the facial features of the young man. In all honesty he exudes an aura of conflict because of how much battle he has seen. His jawline is rather hard and his face is almost always stern. But that's only when he's reading or thinking really hard on something. Otherwise he has a calm and contempt expression on his face. The only odd part is the fact that his gray eyes show a youthful gleam when he is excited. It should be noted that he always has a book on him which he reads through a pair of black framed reading glasses. Blazing Moon: A multi-layered attack that starts with freezing the entire area around Rence with him at the center. After this he leaps once into the air which serves the shatter the entire block of ice damaging every enemy caught within it. From there he charges a single fire spell with the gun portion of his blade and fires it at the ice only to jet towards it and slice with a fire spelled blade causing a massive explosion that deals the blunt of the damage. Mana Switch: A gunblade what switches between a long-barreled pistol into a sword. The hilt of the weapon is lined with tiny sensors that read and direct his mana through the item so that when he fires the gun the bullets are made of his own mana and also allows him to cast his magic through the item. But while in the sword form it simply draws in the mana in order to reinforce the blade. The only drawback to this weapon is the range. Added with Terrance's horrible accuracy, he must be close to the target in order to use the gun portion of the blade. I'll be posting a template soon too! "My road is what matters. The Road of Future." Cana was raised as an orphan in a small home with eight other orphans. But it was hardly depressing, because she was brought up in a mildly warm household with people who genuinely cared for the children. Yet as she grew older, and being the oldest child in the group and the ‘older sister’ figure for most of the other kids, she knew that they (including her) feared the possibility of having no one when they became adults. In the house, there was a rule that once you become sixteen, you are off on your own. So she tried her best to prepare herself for that day, either by saving up, or collecting random things just to make her feel as though she had something in her life that she could bring along when she had to leave. Once the day came, she had to leave. New children who needed more help would arrive, and she fully understood that. She tried to be as detached as possible, but to no avail. She would miss them dearly. As she was leaving, her caretaker mentioned to Cana about The Academy, which immediately sparked her interest, mainly because it provided all her basic needs. Hasty as she was, she chose to enter the Academy immediately. There was nothing else that she could see in her future that didn’t involve a better opportunity than this. Cana usually likes to start a conversation with people, but she can often be straightforward in her opinions, even though she doesn’t intend to offend others. However, she doesn’t think she makes friends, but just acquaintances. She can start conversations, but she can never hold on to them. Basically, she’s bad at making friends. She always finds the need to move, so it isn’t surprising to see her shifting positions at certain times. Cana is hardly lady-like. She can get aggressive, and she can be impetuous. She doesn’t care about looks, and she dislikes being treated with sympathy. She was also known to be a small bully when she was in elementary school. Despite that, she does feel lonely (because she never found anywhere better than her orphanage) and she always does end up appearing near someone she knows, vaguely or not. Cana stands at 5 feet, fully aware that she is short. She once had shoulder length hair and then decided to cut it off with a dagger when she left the orphanage, thinking that it would be easier with short hair. Now her shiny black hair is a short, messy cut of about neck length, with some strands of hair sticking out. Her eyes are a striking olive green, which underlies her slightly defensive attitude to strangers, and her lips a sheer pink which you would rarely see curve into a wide smile. Her face looks androgynous with the hair cut, but her body is obviously feminine—she has a prominent chest and hips, but also somewhat lanky. Despite that, she stands with a straight back, and gives the air that she doesn’t intend to let others mess around with her. Had she not been wearing the school uniform, she would probably just wear a tank top and cargo pants, or something along those lines. She just isn’t so concerned with her appearance that she doesn’t bother about it. Grade and Rank: Grade 6, Cadet. Fury’s Liberation – Going berserk, her strength, defense, and agility increase significantly. She doesn’t really lose sight of who is friend or foe, but she cares less of anyone around when she uses her power. She inflicts damage by using a stronger version of Pain without having to look into the opponent’s eyes, and using dark balls of flames. How or when she reverts to normal is unpredictable, but it can be done by herself or by someone else, and definitely when she is exhausted. Weapon: Clawed gauntlets that she uses to pierce through her enemy’s skin, that reach up to her wrists. - To compensate her loneliness as much as she can, she reads. She is a bookworm, and likes to create or remember stories in her mind. - She gets irritated when someone mentions her short height to poke fun at her. @ Mistearea, Blue: Both your templates are accepted :3. Looking forward to see your characters in the RP ;D.
Background: Born into a middle class family as a single child, Asahina grew up kind of awkwardly. Her parents were hardly ever there for her, and when they were it was always for their own benefit. Normally this would cause a child to act out for attention, however Asahina convinced herself that her parents loved her, so she would always try her hardest to make them 'proud.' She never fit in with any other kids and would usually do embarrassing things to be 'accepted.' She knew she was simply being used, but to her any kind of attention was enough for her. One day this habit cost her dearly. Her 'friends' were bored so they decided to pull a prank on her. They told her to break into the office of their school's principle and loosen the bolts on his chair, which should result in a great fall. However things turned sour when they locked her in the office. She spent the entire weekend in the office sulking and wondering what she'd done wrong. When she finally got out, she became a social outcast, she avoided people and they avoided her. She was 14 then, and the impact was traumatizing enough that she decided to enter the academy throwing away her old life. Personality: Too darn timid and nice for her own good, Asahina can't stand it if someone thinks of her with negativity. She cares very much what others think of her, too much in fact. She feels as though if she cannot be useful then she has no purpose. She tends to break down in high pressure situations, because of this she can be a bit of a pushover and has self-confidence issues. Regardless of this she still has her own values and sense of mind. She knows the difference between right and wrong, and tries her best to live up to her ever straining conscious. When talking with others she does so in a soft voice, and measures each and every word being careful to not say anything stupid. It wouldn't be too far-fetched to say that Asahina has a bit of growing up to do, because of her self-esteem problems she tends to rely on others, not wanting to put pressure on herself. "My road is what matters. The Road of . . . Something-or-Other." Background: Raised in a comfortably wealthy home, with government-employed parents, Auster Hyne enjoyed a peaceful childhood. With a love for music and literature, he became quite the “indoor lad”. After every book in the library was exhausted (or deemed uninteresting), his mother sent for imported books—obscure texts, for a young man to desire. Auster read them all, annotating each with a careful pen. He formed connections between texts, studied the histories of authors and their respective cultures, and spent many late nights writing material of his own . . .
. . . . Then he grew bored, and miserable. His texts grew more esoteric by the year, and Auster was so rooted in philosophical theory that the bright young scholar turned into a bitter cynic. Sensing some depression in their son, the Hynes sent him to the Academy after his fifteenth birthday—in the hope that it would rekindle his spirits. Auster excelled . . . and was, on the whole, unimpressed. Only the History and Magical Support Division held any interest for him, when he was approached by its director about special assignments. The Head of the Division marked Hyne's talents quickly; Auster, in response, applied himself to espionage and the manipulation of data. He has now been marked as the right hand of the Division Head—for, unlike the other divisions, History and Magical Support is headed by a director who stays for most of their career. He or she is always looking for someone to whom they can delegate responsibility (and eventually, the position itself). People are not sought out for this position; rather, the position continually seeks out possible replacements, even when the current director is in full health. Auster Hyne seems to be a winner. Despite his apparent lack of enthusiasm, he is sharp, competent, and very thorough. Hyne will graduate after this year, and has already been promised a sub-directorial position, from which he will manage half of the department's work, beneath the Division Head. Personality: Auster Hyne is something like an iceberg: He moves according to his own plans, with no ill intent to what he does—but no care for any wrecks he may cause along the way. He is socially competent, able to maintain healthy conversation with someone, but never seeks out company of his own initiative. On the whole, people fail to interest him—and when they do, he treats them with the air of a distracted physician. His accurate, often caustic observations have wounded more than a few. He lives only for his private work—writing and theorizing about any number of subjects, particularly the state of the nation and the Academy. This writing is Auster's only passion, though “frustration” might be a more accurate term. Nothing he writes ever seems to satisfy him, only embitter him further. No person or institution has escaped his criticism, the Aspsis being no exception. The Academy's counter-culture movements frequently turn to him for material, although he has never joined or actually supported any one of them. Frankly, Auster hasn't the initiative to actually do much beyond his required work, though his work is always top-notch. He uses his unique position to excuse any number of minor transgressions—such as his complete disregard for the Academy's uniform. He always seeks mental diversion (whether or not it be at someone's expense), falling into a bitter depression when he has none. The wisest course of action is not to irk him, lest he find some nasty secret of yours—because Auster will find it. Appearance: Of average height, sharp-featured and dark-eyed, Auster already has the look of a scholar—which nights of sleepless study has amplified. His eyes are framed by sharp, inquisitive eyebrows above, and perpetual dark circles below. Worn swept-back, his thick brown hair reaches to about the nape of his neck, and sweeps wildly out-of-place when he doesn't care to groom it. Auster keeps a clean-cut appearance outside the dormitory—always smoothly shaven, with impeccable grooming. On those days, he always wears a crisp collared shirt, and a vest of some sort. Slacks and polished shoes complete his Academy attire—the attire of a philosopher, not a young man. He never wears the Academy's uniform; if he remembers, he'll sometimes place the Academy pin on his collar. Formal occasions prompt a cravat or ascot, and he owns a variety of scarves for outerwear. In his dormitory, however, Auster will simply throw a wrinkled shirt over his head, and put on some day-old slacks. No need for appearances there. On missions that require actual sneaking, Auster garbs himself totally in black—a cassock-like garment, complete with black trousers, gloves, and silent boots. A mask lifts up from his collar, to cover the lower portion of his face. With Vanish or Shadow Walk cast about him, Auster is intangible as a wraith. Grade and Rank: Grade 7; officially unranked, due to the nature of his Aspis work. Limit Break: “Shade Impulse” - A miasma of choking black mist surrounds Auster and his foes, and light flees from the battlefield. His movements are frighteningly quick, motivated by cold contempt for his opponent. In total silence, Auster decimates his foes—who themselves cannot utter a sound as his dagger drains them of life. It quite literally “drains” them; the more opponents Auster is able to slay, the longer he is able to sustain this state. Weapon: When missions call for actual sneaking, Auster brings a plain-looking dagger, made specially for him by certain friends in the Magitek labs. When activated, it casts an immediate Silence effect on foes, and can then be used to channel spells such as Immobilize and Confuse. The spells remain in effect only as long as the dagger holds contact with the victim's flesh. If caught from behind, an opponent can be rendered helpless—but only when contact is made with certain points. Otherwise, the dagger's effects are only partially effective. The ethical questions of such a tool need not be mentioned. Clubs: None; to Auster, clubs are a waste of time. @ Pierce, Ordeith-san: Both your characters are accepted and added to the front page. Thrilled to have you in =3. So have all invited roleplayers responded? If so, I'd recommend sending out a few more; it never hurts to ask. I'm considering sending out more invitations but if they do post their templates before that, I'm going to get it on with and start the RP =).